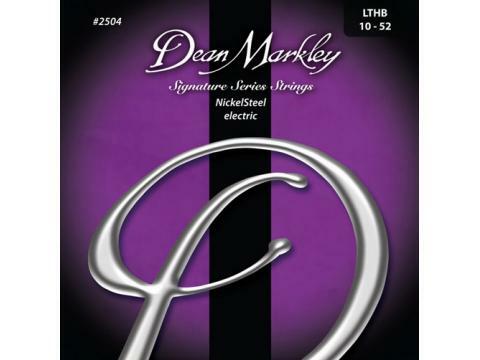 Online Catalogue » Guitar Strings » Dean Markley » Dean Markley Electric Guitar » Dean Markley NickelSteel Electric 2504 - 10-52 L.T.H.B. Notify me of updates to Dean Markley NickelSteel Electric 2504 - 10-52 L.T.H.B. Dean Markley NickelSteel Electric 2504 - 10-52 L.T.H.B. With nickel-plated steel hand-wound slowly over a hex core, the outer string wrap maintains100% contact with the core. The result? A string that vibrates completely for maximum sustain, creating a warm, full sound distinctive of classic rock and roll. The core-to-wrap ratio makes bending easier than other strings, too.